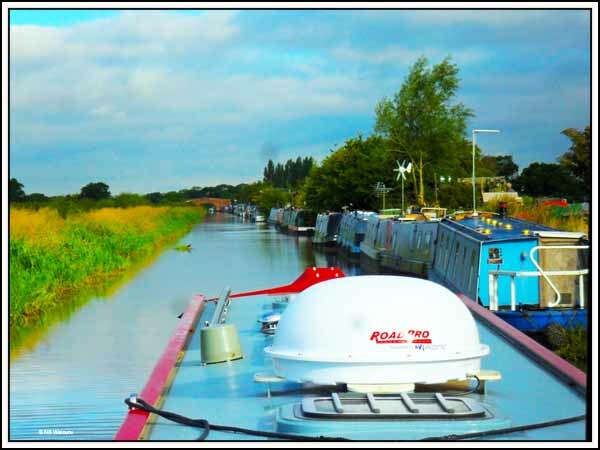 The last time we went past such a long line of linear moored boats would have been on the South Oxford Canal. 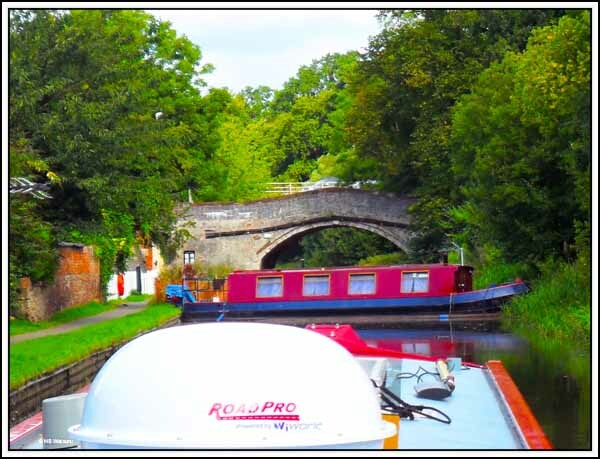 It was a late start to the day (8.15am) and after a very brief cruise from the 48 hour moorings at Tattenhall Marina we reached the beginning of 2.5 kilometres of long term moored boats just around the bend from Nixon’s Bridge. We passed boats at ‘tick-over’ and it took us an hour to cruise past this long line of linear moored boats. Obviously we’re not working to a timetable and can afford to spend an hour on tick-over. However I can understand how a hire boater might be tempted to go faster as they are working to a timetable! 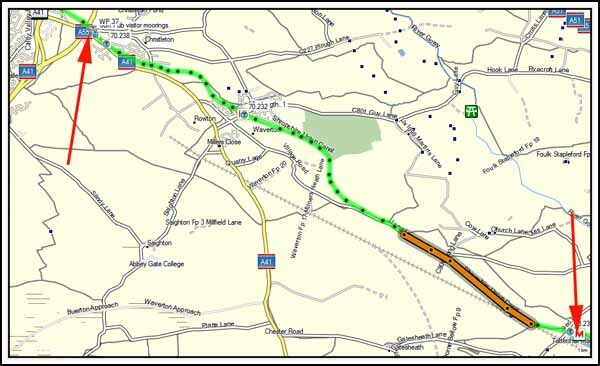 The route covered today can been seen on the following screen dump. The orange line denotes the linear moored boats. Start point is in the bottom right and our current mooring in to top left. As we got closer to our planned destination Jan noticed a sign we haven’t seen since leaving Australia. 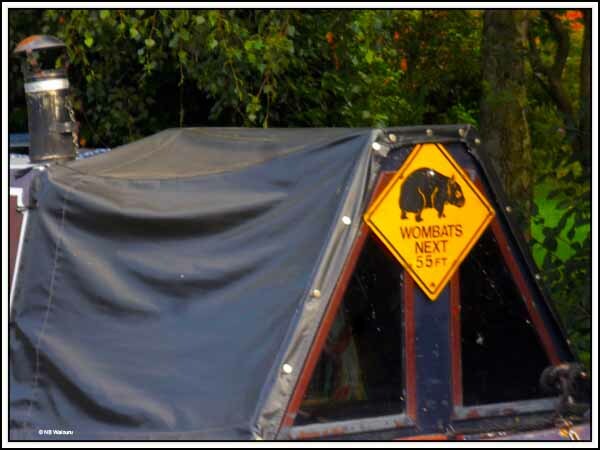 And the name of the boat was “Wombat”. Yes, the boat’s length was 55ft! As we passed through the bridge hole at Quarry Bridge it was apparent a boat was loose and across the canal. Fortunately it was beyond the 48 hour moorings which is where we had planned to moor for the night. The crew returned to the boat shortly after this photo was taken and resecured it. They have used stakes whereas we have used ‘nappy pins’ to moor Waiouru. It didn’t take long to realise why the boat had been adrift as another boat ‘rocketed past causing Waiouru to pull back and forth as well as listing heavily. B@stards! 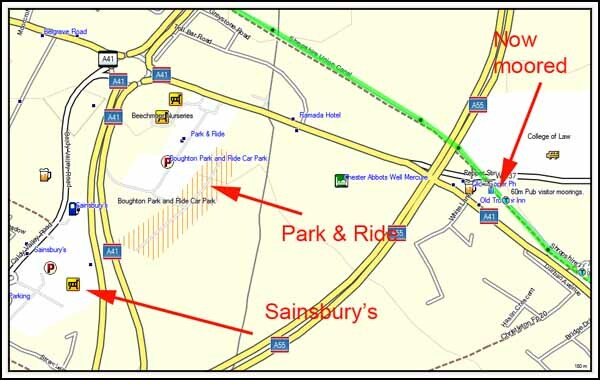 The mooring is very handy to one of the Chester ‘Park & Ride stations and a large Sainsbury’s is slightly further on. Jan has been feeling a little “off colour” so I walked to the Sainsbury’s and even managed to stick to her shopping list! The plan is to use the ‘Park & Ride’ to get into Chester tomorrow. We may stay on the current moorings tonight and Saturday night rather than moor further into Chester on what are probably the busiest nights of the week. Tom, wise choice to stay put for the weekend. Whilst Chester is great at weekends it can get a little noisy in town as night with the party goers and clubbers. Quieter during the week though. Yes, I walked into the town along the towpath yesterday evening and it was starting to get both busy and noisy!